Samuel Hellier was baptized in St Clement Danes, London on 18 Nov 1736, the son of Samuel Hellier, a Staffordshire landowner, barrister and antiquary. He was knighted in 1762, after serving as High Sheriff of Worcestershire in 1760 and making a well received speech on the birth of the Prince of Wales, the future George IV. His father, who died in 1751, had accumulated estates across Staffordshire and Worcestershire, including the new family seat of the Wodehouse, Wombourne. 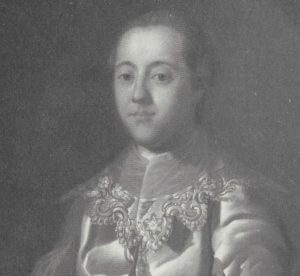 Sir Samuel was also the heir, through his mother, of the Huntbach’s family estates at Featherstone, but did not inherit until his dowager grandmother died in 1782. He himself died two years later bequeathing everything to Rev Thomas Shaw. Sir Samuel Hellier’s grandfather and great grandfather had been merchants in London and through his grandfather’s marriage to the heiress Penelope Harris in 1698 had staked a claim to build and become part of the Staffordshire landed gentry, pursuing a range of cultural activities. Sir Samuel, the fourth Samuel Hellier in a row, was thus put in the position to finally accomplish the culmination of this idyll, built up over four generations. He is renowned for his avid collecting, most notably musical instruments. but he also indulged himself in fossils, coins and books. Some of these collections were left by his will to the Ashmolean museum in Oxford. A number of his letters have survived in which he discusses his collections and passion for music and musical instruments. The Huntbach side of the family had a deep and abiding interest in history, genealogy and what was generally known at the time as ‘antiquarianism’. This ‘fashion’ is described in Rosemary Sweet’s book Antiquaries: The Discovery of the Past in Eighteenth-Century Britain. His father, who had started many of these collections in the 1720’s, died when Samuel Junior was fifteen. Sir Samuel’s further education seems to have been supervised by his guardian Charles Lyttleton, another noted antiquary. Richard Gough, another leading member of the nascent Society of Antiquaries, was a cousin. His great grandfather was John Huntbach (1639-1705), yet another noted collector of manuscripts. John Huntbach’s uncle was Sir William Dugdale, Norroy appointed by Charles II. All this gave Sir Samuel impeccable credentials as an antiquary. Samuel clearly had a difficult childhood with his mother dying when he was 10 and father when he was fifteen. He is said to have learnt little at the Free School at Birmingham but clearly gained much from Charles Lyttleton in terms of Oxford and connections to the highest in Society. The relations with his stepmother, his father’s third wife, were apparently good but the arguments over wills, money and property after his father’s death were at best unseemly. The portrait attached is attributed to James Shaw, the artist. James Shaw was the younger brother of Thomas Shaw not to be confused with James Shaw, father of Thomas’s bride, who was erstwhile attorney to Samuel Hellier, senior. More detail about the Musical Instruments can be read in the piece by Frew and Meyers, more about the Book collection in the piece by Percy Young, and more about the Wodehouse and the design of the garden in the piece by Dianne Barre. All three rely heavily on the Rogers correspondence. Samuel Hellier died on 12 Oct 1784 and was buried in the family vault in St Benedict, Wombourne alongside his grandfather (1672-1727), great uncle (1680-1719), grandmother (1672-1735), father (1699-1751) and mother (1710-1745). Will of Dame Elizabeth Cookes Winford/Hellier, Probate 22 Dec 1753, PCC (Stepmother).